Download "Quality for All and All for Quality"
3 The Transdisciplinary Themes It is recognised that educating students in a set of isolated subject areas, while necessary, is not sufficient. Of equal importance is the need to acquire skills in context, and to explore content that is relevant to students, and transcends the boundaries of the traditional subjects. Through acknowledging the diverse needs of the student physical, social, intellectual, aesthetic, cultural PYP schools ensure that the learning is engaging, relevant, challenging and significant for all learners. 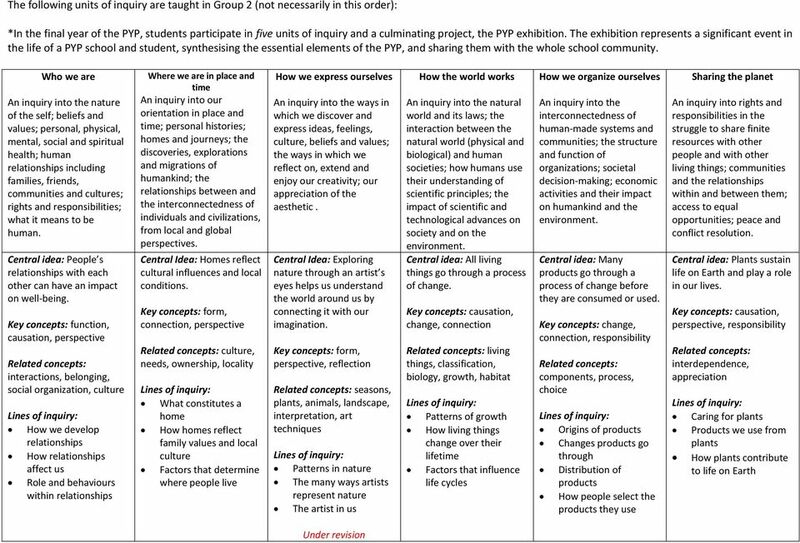 What adds significance to student learning in the PYP is its commitment to a transdisciplinary model, whereby global themes frame the learning throughout the primary years, including in the early years. These themes promote an awareness of the human condition and an understanding that there is a commonality of human experience. The students explore this common ground collaboratively, from the multiple perspectives of their individual experiences and backgrounds. This sharing of experience increases the students awareness of, and sensitivity to, the experiences of others beyond the local or national community. It is central to the programme and a critical element in developing an international perspective, which must begin with each student s ability to consider and reflect upon the point of view of someone else in the same class. These transdisciplinary themes promote an awareness of the human condition and an understanding that there is a commonality of human experience. These commonalities: have global significance for all students in all cultures are supported by knowledge, concepts and skills from the traditional subject areas but utilize them in ways that transcend the confines of these subjects, thereby contributing to a transdisciplinary model of teaching and learning will be revisited throughout the students years of schooling, so that the end result is immersion in broadranging, in-depth, articulated curriculum content contribute to the common ground that unifies the curriculums in all PYP schools. Students inquire into, and learn about, these globally significant issues in the context of units of inquiry, each of which addresses a central idea relevant to a particular transdisciplinary theme. Lines of inquiry are identified in order to explore the scope of the central idea for each unit. These units collectively constitute the school s programme of inquiry. 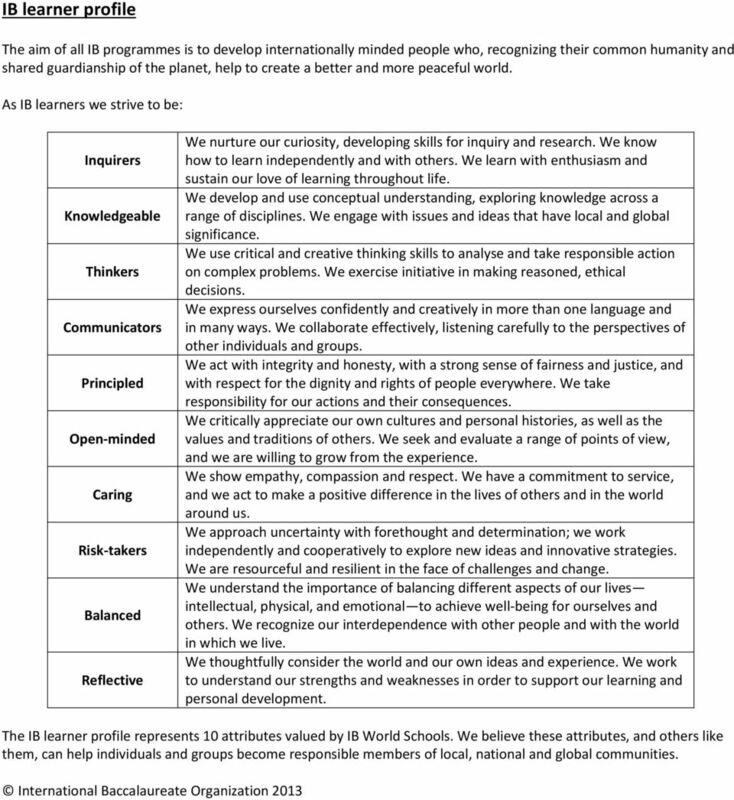 The themes provide a basis for much discussion and interpretation within a school, and allow for both local and global perspectives to be explored in the units. 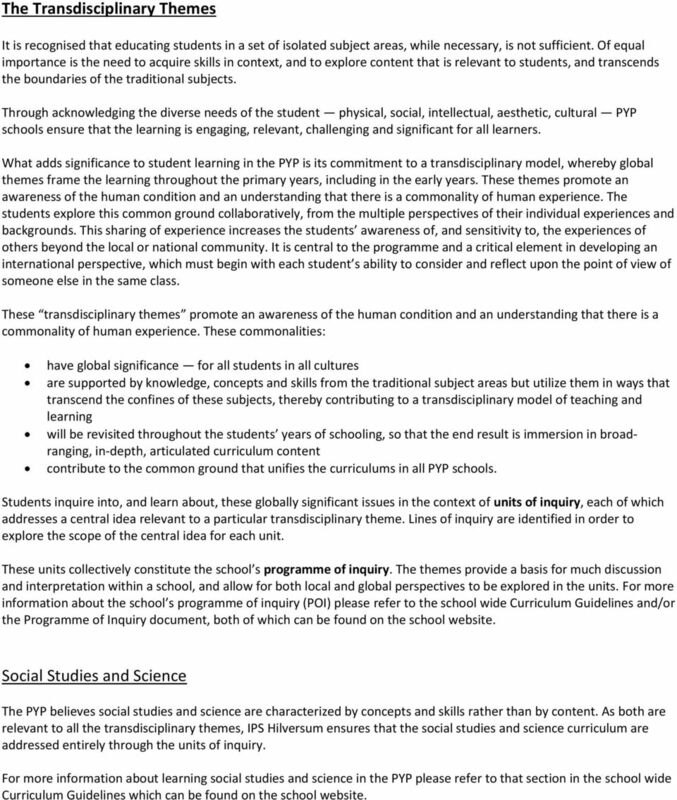 For more information about the school s programme of inquiry (POI) please refer to the school wide Curriculum Guidelines and/or the Programme of Inquiry document, both of which can be found on the school website. Social Studies and Science The PYP believes social studies and science are characterized by concepts and skills rather than by content. 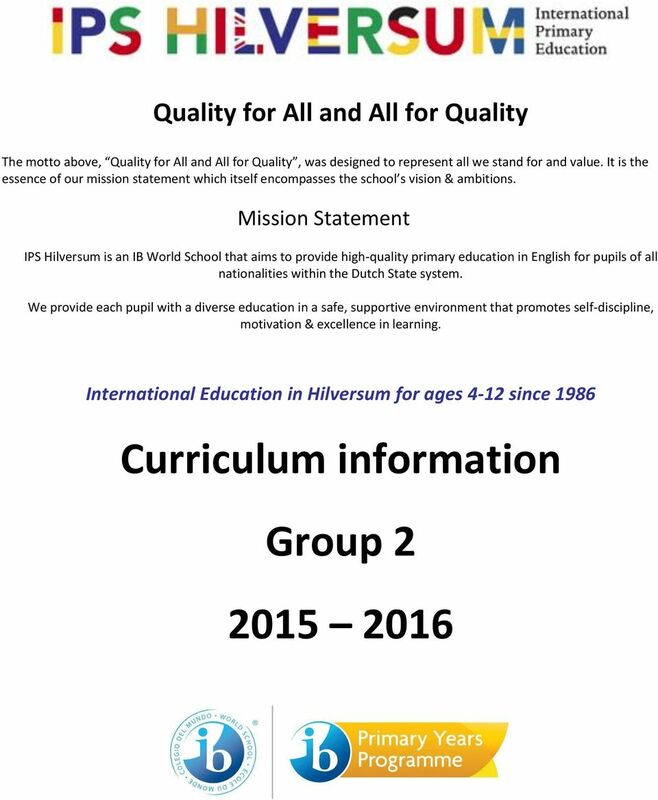 As both are relevant to all the transdisciplinary themes, IPS Hilversum ensures that the social studies and science curriculum are addressed entirely through the units of inquiry. For more information about learning social studies and science in the PYP please refer to that section in the school wide Curriculum Guidelines which can be found on the school website. 5 Language Language is fundamental to learning, thinking and communicating. It enables us to make sense of the world around us. It is necessary not only to learn language, but also learn about language and through language. All students will need to develop the ability and confidence to communicate competently in English, in both its spoken and written forms. Language is the major connecting element across the curriculum. Therefore, in a PYP school, the focus is not only on language for its own sake, but also on its application across the subject areas and throughout the transdisciplinary programme of inquiry. The expectations in the language curriculum are organized into three strands: Oral, Visual and Written communication. The program throughout the school is designed to develop a range of essential skills in these three interrelated areas, built on a solid foundation of knowledge of the conventions of Standard English. 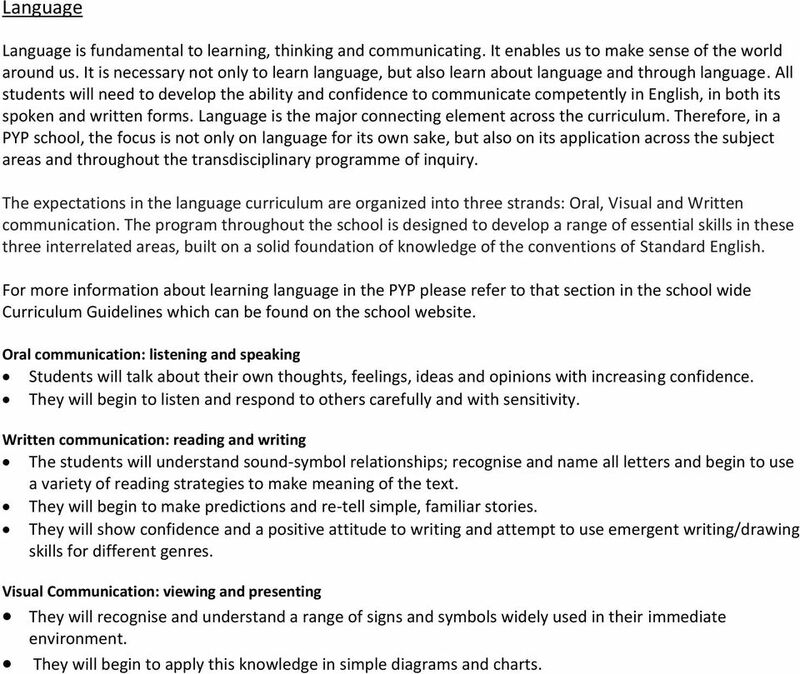 For more information about learning language in the PYP please refer to that section in the school wide Curriculum Guidelines which can be found on the school website. Oral communication: listening and speaking Students will talk about their own thoughts, feelings, ideas and opinions with increasing confidence. They will begin to listen and respond to others carefully and with sensitivity. Written communication: reading and writing The students will understand sound-symbol relationships; recognise and name all letters and begin to use a variety of reading strategies to make meaning of the text. They will begin to make predictions and re-tell simple, familiar stories. They will show confidence and a positive attitude to writing and attempt to use emergent writing/drawing skills for different genres. Visual Communication: viewing and presenting They will recognise and understand a range of signs and symbols widely used in their immediate environment. They will begin to apply this knowledge in simple diagrams and charts. 6 Mathematics Mathematics is no longer regarded as being merely a fixed group of algorithms to be transmitted to the students, but has become a way of thinking and a language for understanding. The study of mathematics has evolved into an inquiry into this language and learning. The major expectations regarding learning content have been arranged into five strands of knowledge. In Number and Pattern & Function, students inquire into our number systems, operations, patterns & functions. These are the two areas where students increase their fluency in the language of arithmetic, as they learn to encode and decode its meaning, symbols and practises. Mathematics provides the models, systems and processes for handling data, making and comparing measurements and solving spatial problems. Inquiry-based units are entry points into mathematics through which students will determine the content for the strands Data Handling, Measurement and Shape & Space. 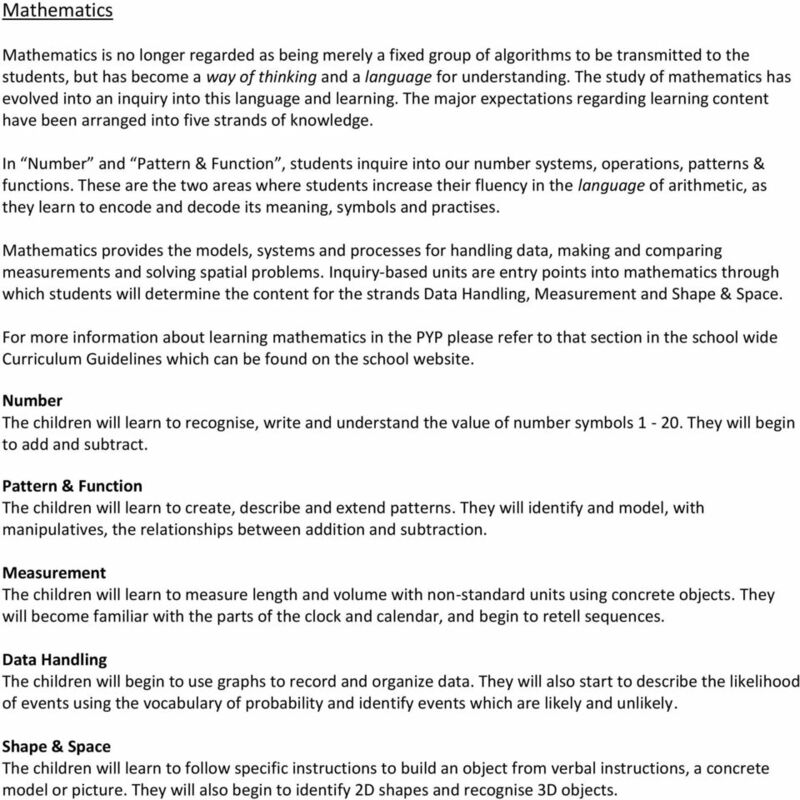 For more information about learning mathematics in the PYP please refer to that section in the school wide Curriculum Guidelines which can be found on the school website. Number The children will learn to recognise, write and understand the value of number symbols They will begin to add and subtract. Pattern & Function The children will learn to create, describe and extend patterns. They will identify and model, with manipulatives, the relationships between addition and subtraction. Measurement The children will learn to measure length and volume with non-standard units using concrete objects. They will become familiar with the parts of the clock and calendar, and begin to retell sequences. Data Handling The children will begin to use graphs to record and organize data. They will also start to describe the likelihood of events using the vocabulary of probability and identify events which are likely and unlikely. Shape & Space The children will learn to follow specific instructions to build an object from verbal instructions, a concrete model or picture. They will also begin to identify 2D shapes and recognise 3D objects. 7 Mother Tongue Language Research shows that development of mother tongue language is crucial for cognitive development and in maintaining cultural identity. It also has the potential to increase intercultural awareness and understanding, and enables students to remain in touch with the language, literature and culture of their home country. It is a strong predictor of their long-term academic achievement, including acquisition of other languages. The acquisition of more than one language enriches personal growth and helps facilitate international understanding. The PYP recognises and respects the value of every student s mother tongue and home culture. We encourage parents of students who are studying English as an additional language to continue the development of their child s mother tongue at home and outside school. There are also opportunities in the classroom where students are encouraged to read and discuss school assignments in their mother tongue with fellow students. They may also be given home activities which include translating vocabulary and discussing specific assignments in their mother tongue, which help deepen their conceptual understanding. English as an Additional Language The EAL department provides extra English support to students who arrive at our school with little or no English language skills. This support may be in the form of one on one, in a group or within the classroom depending on the individual needs of each student. The EAL teachers work alongside the class teachers to assess the individual language needs of each student and help to reinforce and consolidate new ideas and concepts as they are introduced. The main goals of our EAL programme are to work towards increasing the range, depth and proficiency of the student s language skills to enable them to understand academic concepts and vocabulary. The EAL programme is made up of six stages of language development: New to English, Early Acquisition, Becoming Familiar, Becoming Competent, Becoming Fluent, and Fluent. As the students progress, they move through the programme until they reach a high enough level of fluency and understanding to be able to function successfully in the academic environment of the classroom. At this point, the students exit the programme. 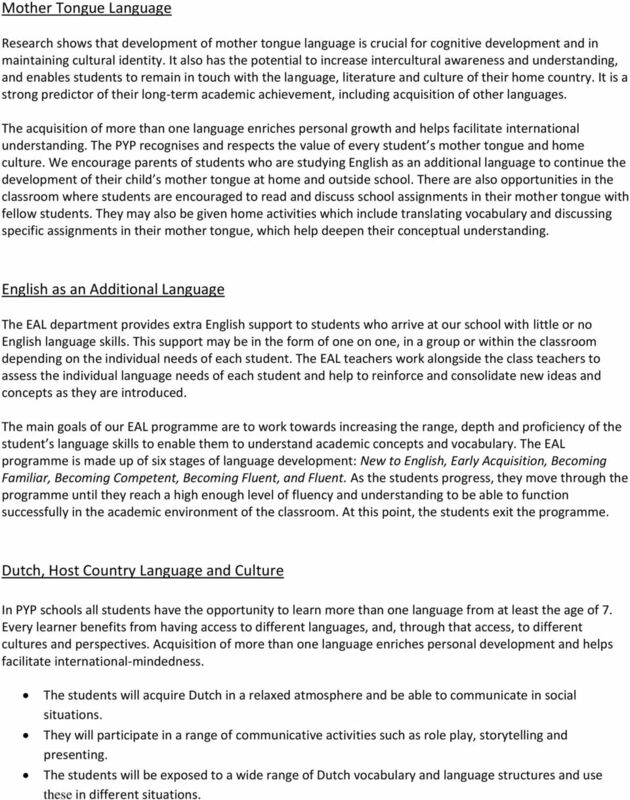 Dutch, Host Country Language and Culture In PYP schools all students have the opportunity to learn more than one language from at least the age of 7. Every learner benefits from having access to different languages, and, through that access, to different cultures and perspectives. Acquisition of more than one language enriches personal development and helps facilitate international-mindedness. The students will acquire Dutch in a relaxed atmosphere and be able to communicate in social situations. They will participate in a range of communicative activities such as role play, storytelling and presenting. The students will be exposed to a wide range of Dutch vocabulary and language structures and use these in different situations. 8 The students will take part in key celebrations such as Sinterklaas and King s Day to develop an appreciation of Dutch culture. 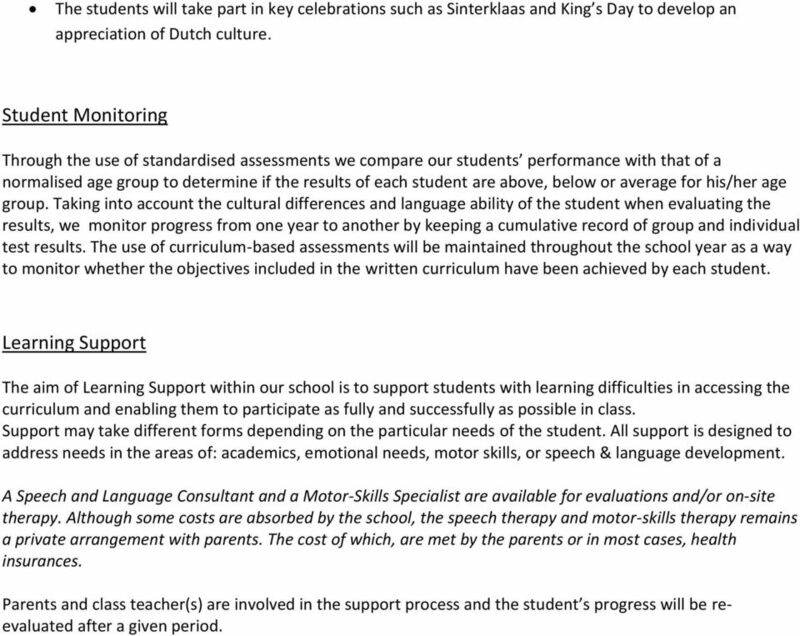 Student Monitoring Through the use of standardised assessments we compare our students performance with that of a normalised age group to determine if the results of each student are above, below or average for his/her age group. Taking into account the cultural differences and language ability of the student when evaluating the results, we monitor progress from one year to another by keeping a cumulative record of group and individual test results. The use of curriculum-based assessments will be maintained throughout the school year as a way to monitor whether the objectives included in the written curriculum have been achieved by each student. Learning Support The aim of Learning Support within our school is to support students with learning difficulties in accessing the curriculum and enabling them to participate as fully and successfully as possible in class. Support may take different forms depending on the particular needs of the student. All support is designed to address needs in the areas of: academics, emotional needs, motor skills, or speech & language development. A Speech and Language Consultant and a Motor-Skills Specialist are available for evaluations and/or on-site therapy. Although some costs are absorbed by the school, the speech therapy and motor-skills therapy remains a private arrangement with parents. The cost of which, are met by the parents or in most cases, health insurances. Parents and class teacher(s) are involved in the support process and the student s progress will be reevaluated after a given period.